Kevin Sauer, associate professor of dietetics in the College of Human Ecology's food, nutrition, dietetics and health department, is among the 19 new national leaders in nutrition, health and business elected to the board of directors of the Academy of Nutrition and Dietetics. This organization represents more than 100,000 credentialed practitioners and is the world's largest organization of food and nutrition professionals. For the next academic year, Sauer will be responsible for planning various events, developing policies and regulating fiscal management under the academy. 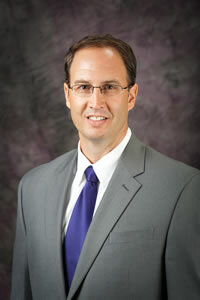 Sauer received his undergraduate, master's and doctoral degrees from K-State. Sauer specializes in management of food and nutrition services and also is the co-principal researcher with the Center of Excellence for Food and Safety Research in Child Nutrition Programs. Sauer's many teaching and research awards include the Mary Ruth Bedford Distinguished Faculty Award in 2016; Commerce Bank Award for Outstanding Undergraduate Teaching in 2013; Excellence in Engagement Award in 2013; Joan Coleman Faculty Excellence Award in Hospitality Management and Dietetics in 2012; and the Mortar Board Outstanding Faculty Award in 2009. In 2015, he was awarded the Distinguished Dietitian of the Year Award from the Kansas Academy of Nutrition and Dietetics. Previous leadership roles held include past chair of the Commission on Dietetic Registration and past chair of Commission on Dietetic Registration's Examination Panel. Currently Sauer is a member of the School Nutrition Association Governing Council and the Kansas Department of Education's Child Nutrition and Wellness Advisory Committee. Sauer will be a contributing member on the academy's board of directors for three years.